Join Mosaic, Syria Relief and some of the biggest international and local artists for ‘Voices for Syria’! A 4-city tour with Omar Offendum (USA), Baba Ali (USA), The Sound of Reason (Canada), Native Sun (UK) and Khaled M (US). Mosaic Syria is supporting the London concert to raise much needed funds for orphans in Syria. 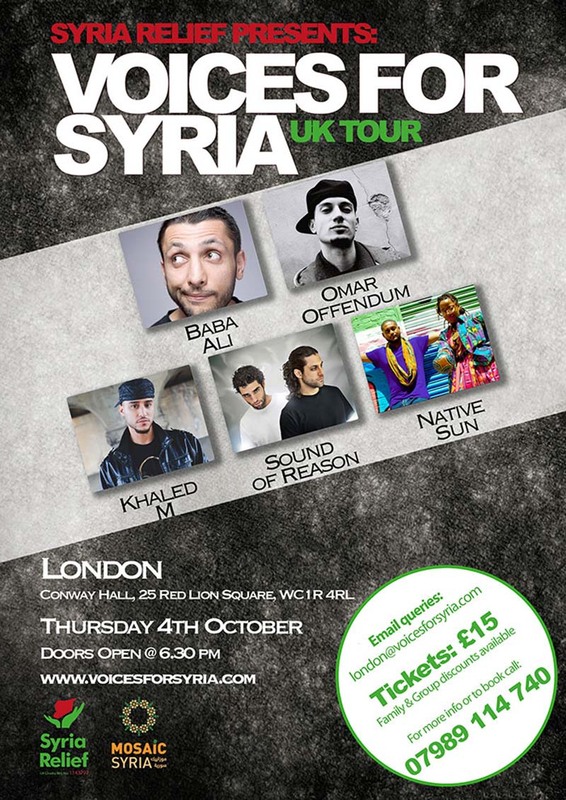 For more info & to buy your tickets visit www.voicesforsyria.com or call 0161 860 0163. Buy a ticket now and help us help make a difference in Syria: https://vfslondon.eventbrite.co.uk/Family & group discounts available.